I am excited to be speaking at WordCamp Fayetteville 2018 on June 23rd at 4pm! This is my second year speaking at WordCamp Fayetteville. Last year I presented about all the things website owners need to do before they start blogging. 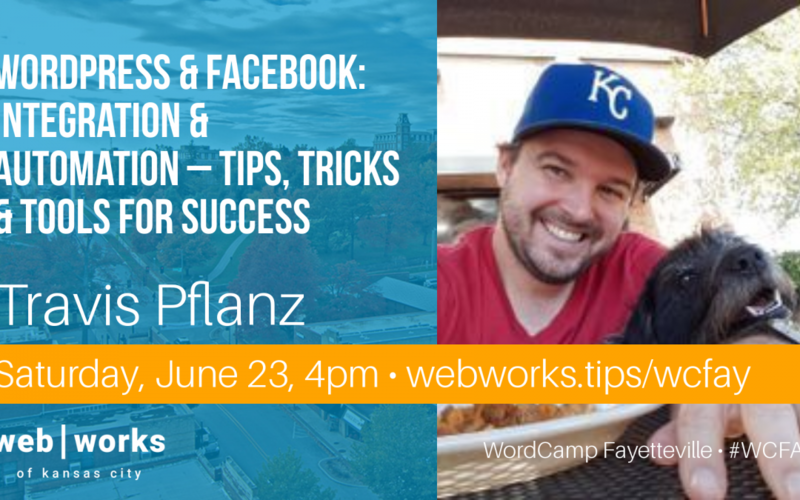 This is my first presentation about Facebook and WordPress integrations, but this should be a great session for all WordPress website owners who are excited to start marketing using Facebook. Let’s talk about everything you can integrate and automate between your WordPress website & Facebook! This session covers everything from simply sharing a new blog post to your Facebook page – to keeping evergreen content in the social media funnel – all the way to showing a specific Facebook ad to a previous visitor to your website. WordCamp Fayetteville tickets are only $20 for the one day conference and all 18 WordPress-centric sessions on June 23rd. With your ticket, you also get access to the welcome party on June 22nd and the all day help session on June 24th. » Get your WordCamp Fayetteville Ticket! Are you coming to WordCamp Fayetteville? If you’re coming to my WordCamp Fayetteville, click below to tweet and let me know!